It's already time for the first review of February, and as stated last week, SuperPhillip Central is now on a new grading scale system. My first game using this new letter grade review system is Gunman Clive 2 for the Nintendo 3DS eShop. Grab your six-shooter, pardner, and get ready for a good time! Gunman Clive was an unexpected hit and success story on the Nintendo 3DS eShop, one of the most prolific victories for the marketplace yet. It outsold the release on mobile devices and did well for the developer. What makes the story even more fascinating is that the game, other than the music, was created by one person, Bertil Hörberg. Rather than just resting on his laurels, Hörberg returns us to the world of Gunman Clive with a full-fledged sequel with amazing additions and spruced up mechanics, making Gunman Clive 2 a must-own for action fans. Gunman Clive 2 contains the similar formula of the original. It is a retro-styled shooter and platform along the likes of games like Mega Man, only set in a Wild West world. Clive can shoot (picking up power-ups that can expand his firepower), jump, and crouch through the 25 levels in the game that contain a myriad of trials and challenges for him to overcome. From a castle with its own areas of directional gravity, sending Clive walking on walls and ceilings, to a Donkey Kong Country-inspired trek aboard a mine cart, riding through hazardous sections of track, Gunman Clive 2 offers plenty of level variety. They display a grand amount of evolution compared to the original. to mess with Gunman Clive's town. This evolution continues into the boss encounters as well, showing off more complicated bosses, attack patterns, and means to defeat them. 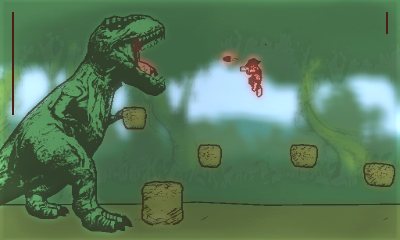 Whether it's a massive Tyrannosaurus Rex that chases our hero or a distinguished gentleman with requisite top hat and monocle, utilizing the game's gravity mechanic to dodge and defeat him, these bosses are definitely a step up from what we saw in the original Gunman Clive. Heck, the final boss is not only a great encounter, but it's also one of the more creative battles in years in how you scale the robotic beast to beat him. Open wide for Gunman Clive! 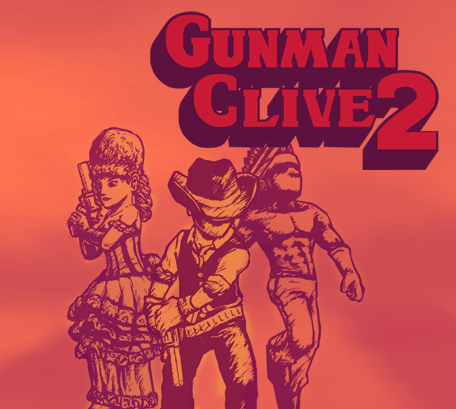 Outside of standard 2D run-and-gun left-to-right affairs, Gunman Clive 2 splits up the action with special levels. For instance, one has Clive on an aircraft with a behind-the-back view as he shoots down enemy balloons and flies through rocky archways. Another level features Clive on horseback, riding through along a desert road, dodging boulders, dealing with fellow horseback riders, and leaping over obstructions in the road. Ah... Sunglasses! I knew I forgot to pack something! 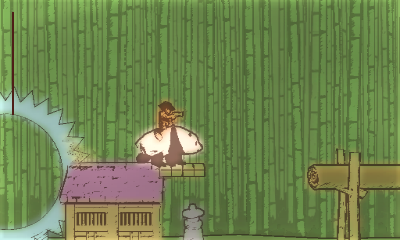 Gunman Clive 2 offers three difficulties, which alter how much health you are given to work with. There is no lives system in the game. When you die, you start from the beginning of the current stage. As levels are mostly short, death isn't that huge of a penalty. It's only later levels that are more lengthy that this can become annoying, especially levels with several "gotcha" moments, where you'll die simply because of a lack of reaction and response time to a specific obstacle. One such case is a falling platform that drops into the abyss. You have to have the reaction time of Sonic the Hedgehog to leap to the necessary platform in order to survive. There are more moments like this than I would have liked, but once they have been learned, the levels become easier to complete. There are four playable characters in Gunman Clive 2. The titular hero is the first, with Ms. Johnson being the second. Her Princess Peach-like ability to float in midair temporarily makes otherwise very challenging jumps more plausible. Then there is Chieftain Bob, who is the most difficult character to play as, as he can only utilize melee attacks via his spear. This takes learning enemy attack patterns a must in order to get close enough to take the appropriate number of shots on a given foe. 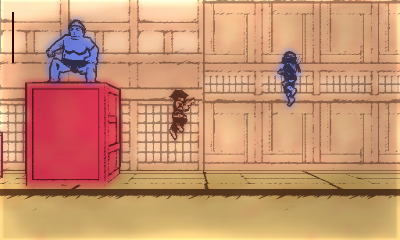 The final character needs to be unlocked, and those who played and enjoyed the original Gunman Clive can probably guess who the character is and how much it changes up how Gunman Clive 2 is played. Like Gunman Clive, Gunman Clive features a very satisfying art style that is reminiscent of an animated wanted poster, full of squiggling lines on the foreground and background. 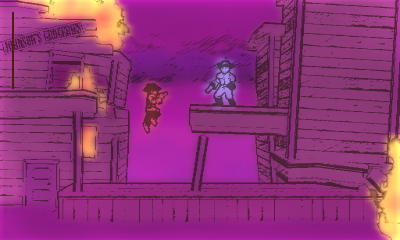 Unlike the original, however, Gunman Clive 2 isn't relegated to one color scheme. Instead, each level presents a different scheme, showing off an abundance of color used rather than the orange, brown, and beige that the original game only offered. The character models are a sight to behold, and the animations are fantastic as well. The music is also quite impressive, featuring a wealth of engaging music that you can catch yourself humming to. Overall, Gunman Clive 2 is a delight presentation-wise. 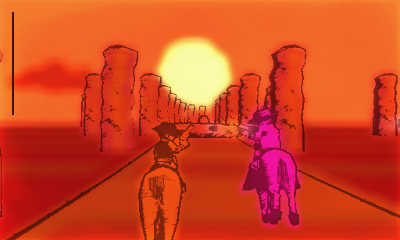 Gunman Clive 2 is just wholly a plain delight. The side-scrolling 2D run-and-gun action is executed beautifully, the level and boss designs have evolved to be more interesting from the original, and the presentation is simply put, dazzling. It's astonishing that one person did the lion's share of development for this game. Gunman Clive 2 isn't a perfect game-- it's short and has some frustrating "gotcha" moments in its level design-- but it's a magnificent display of pure action gaming with a wondrous coat of paint.